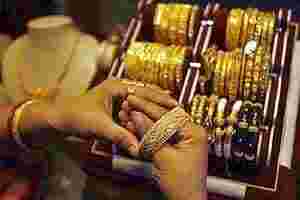 At 1:15pm, the most-active gold for December delivery on the Multi Commodity Exchange (MCX) was 0.06% lower at ₹ 27,971 per 10 grams. Overseas spot gold was almost flat at $1,761.65 an ounce, but headed for its second week of gains. On Thursday, gold rose to $1,767.40, its strongest since 22 September. It had reached a record around $1,920 in September. The rupee strengthened in afternoon trades on Friday nudged by firm local equities but strong dollar demand, most likely for defence-related payments, limited the rise, traders said. Physical buying slowed as traders refrained from placing fresh positions at keenly watched ₹ 28,000 mark. “Buying is not there, it will be like that for some time," said a dealer with a state-run bullion dealing bank in Mumbai.